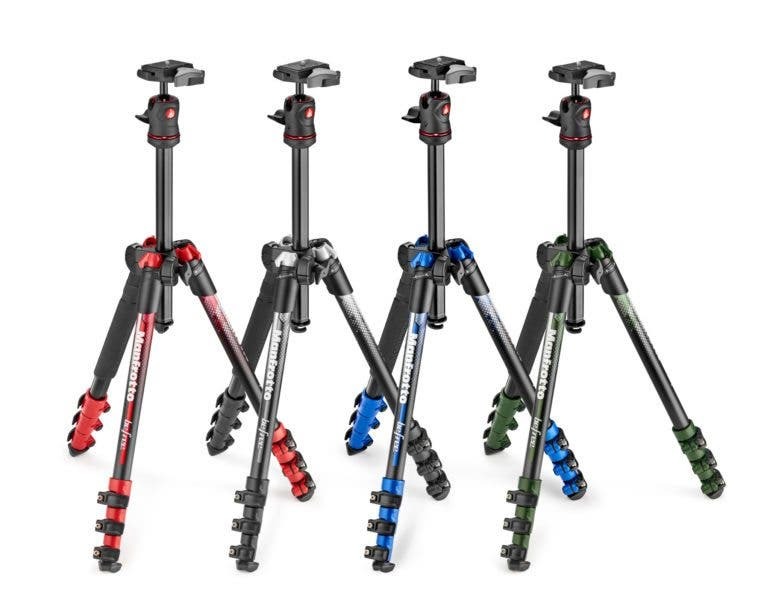 Manfrotto announced the release of four all-new colors in its Befree tripod line. Titled Befree Colors, the new aluminum tripods are now available in Blue, Green, Grey, and Red. According to Manfrotto, the tripods have been given unique graphics and colors to match the users individual style while being a lightweight support for their camera of choice. The Befree tripod line is unique in that the tripods use a folding mechanism allowing the legs to fold completely backwards around the integrated aluminum head. When fully-collapsed the tripods measure 15.7”, with a maximum height of 56.69” when the center column is fully extended. The tripods weigh only 3 lbs and feature a load capacity of 8.8 lbs. Other notable features include a quick release ball head that uses a large ergonomic locking handle, a quick release plate that has a 1/4-20” mounting screw, and a durable carrying case provided for storage and transport. The Befree Color tripods also include two new features. The first is larger rubber feet providing increased grip and coverage over a larger area. The new grip is also designed specifically for providing a secure grip to the ground. The second is extra stability with a newly added hook under the center column, which can be used for attaching an extra weight when needed. I’ve been a user of Manfrotto tripods for many years and have always been impressed with both their durability and reliability. These look like a great addition to their current lineup and I can see many photographers wanting to add a unique color to accompany their kit. How our tools look and feel can often make us feel more inspired to use them, I think these will get a similar reaction from the photographer frequently using a tripod. They’re quite stylish. The only debate left is what color to get? I got my eyes on the blue one! The Befree Color Aluminum tripods are available today at camera stores nationwide. For more info about them visit Manfrotto’s website here.